Although I am no more than an ordinary citizen, my email address book reads like a “Who’s Who” list of skeptic scientists and speakers. Among them, I’ve had the privilege to exchange emails with Dr Willie Soon of the Harvard Smithsonian Center for Astrophysics. Do just a basic internet search for nothing more than his name and you see why he is disgusted by those saying his work is tainted by industry funding. Here, rather than having a written-out guest post, Dr Soon suggested I could place two videos featuring him, followed by a specific comment question he wants to pose to his accusers, along with a statement from a fellow skeptic scientist, Dr Richard Lindzen. He felt this would collectively encapsulate the fatal weakness accusers show when they resort to charter assassination in order to avoid debate on the science of global warming. The first video Dr Soon suggested was of his hour long 4/2/2013 University of Minnesota presentation, where he said at the outset that science should not be subjected to what he calls a strange and ugly political interference, pointing out that no amount of money can influence his opinion. Then he devoted the remainder of the presentation to his detailed scientific analysis of the global warming situation – very humorously, I should add. View that video in its entirety, and you easily see why the woman in the following short confrontation is as foolish as she is. This confrontation occurred at the end of Dr Soon’s similar presentation at the University of Wisconsin on the following day – you see the identical slide of a comical-looking car behind him in each. Dr Soon’s response is fabulous, transferring the burden of proof right back onto her about the assertions she made, chastising her for her rudeness in being unable to engage in debate. Does this educational lecture really go out of the boundaries of reasonable discussion of the scientific and related socio-political issues on CO2 and climate? 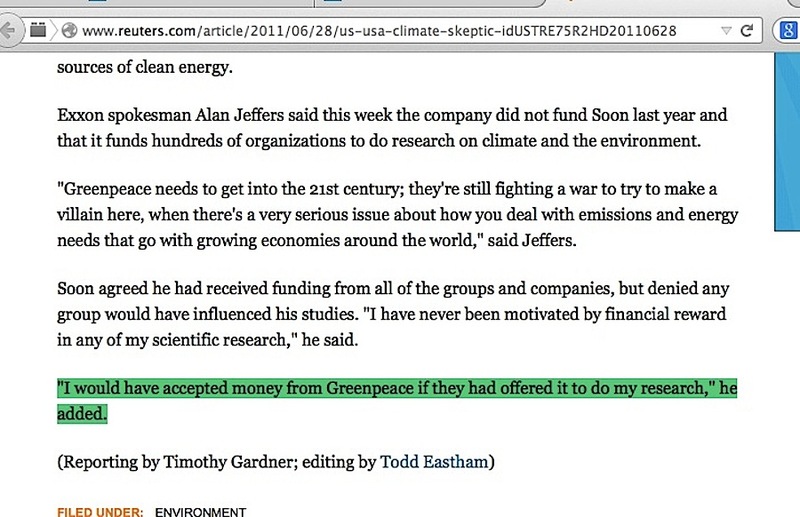 Answer: no, it does not, and this illustrates the entire problem involving people on Al Gore’s side of the issue. The woman accusing Dr Soon of industry corruption could not bring herself to refute anything he said or engage in actual debate on his specific topic points. She instead inferred that money influence had tainted what he said so badly that none of it was worthy of consideration, which crumbles to dust when she and other accusers fail to prove that industry money was given to skeptic scientists in exchange for laughably and demonstratively false fabricated papers, reports or assessments. Folks on the Al Gore side, in other words, have the situation preposterously backwards: they first should shoot down what skeptics say with superior scientific reasoning and analysis, and then nail the coffin shut by proving precisely how skeptics put out fabricated material bought by ‘big coal & oil’. The woman in the second video could not meet either challenge. My thanks to Dr Soon for providing Dr Lindzen’s financial declaration. It’s worthy of its own blog piece here, exploring Gelbspan’s narrative of what Dr Lindzen would charge, compared to what he actually received. More perspective and less prejudice, please. This entry was posted in Character assassination, Guest Post, Narrative derailment and tagged Dr Willie Soon by Russell Cook. Bookmark the permalink.